It�s funny that similarities can often be missed because of a few surface details � after all, who would�ve spotted that The Forbidden Planet is essentially Shakespeare�s The Tempest with a few science fiction bits thrown in? Oh � you did spot that? You�re so cultured! I mention this because � as the gentle reader may remember � I recently played the excellent Herdy Gerdy on the PS2. As it�s an unusual style of game, I reached for comparisons and came up with Lemmings, Sheep Dog �n� Wolf etc., and never once mentioned the Oddworld series. Which, if you�ll pardon the expression, is odd. 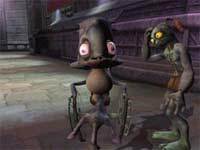 As as soon as you see Abe�s world updated into 3D, you realise that Herdy Gerdy is Oddworld cutesied for the masses. 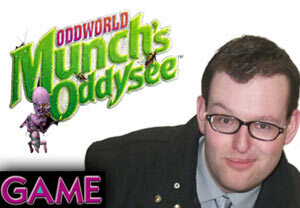 Munch�s Oddysee comes 3D intact with the puzzle elements loved by fans of the original PlayStation series � whereas Gerdy herds his flock with magic flutes and the like, Abe relies on his trademarked GameSpeak. At the touch of a button, our friendly Mudokon can grab the attention of his fellow creatures, get them to perform tasks, follow him or just hang five. 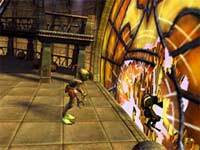 Oddworld: Munch�s Oddysee manages to deliver a cartoony feel, that has enough ugliness and black humour to hook the interest of more cynical gamers. It�s difficult to describe the appeal of Abe � but just look at him. He�s endearing in every way that lesser characters such as Spyro are, but much less saccharine for it � though I imagine some young children may find the look of him slightly disturbing. The game commences with its very own darkly beautiful cut-scene � introducing us to the eponymous hero Munch. A weird fishy creature, and apparently the last of the Gabbits, Munch demonstrates just how effectively the game pulls on the heart-strings without being sugary. I defy anyone to see the opening scenes of Gabbit, alone, frightened, trapped in the metal claws of a bear-trap device � and being surrounded by the bright lights of some malevolent beings without feeling an urge to get involved and save him. And save Munch you must, as you take control of Abe and later Munch himself, to follow the reluctantly heroic Mudokon�s destiny. The plot unfolds slowly at first, and takes some unexpected twists, as you are gently introduced into the game�s dynamics. This is definitely a re-introduction of the series, and old fans will find that once they�ve got the knack of controlling Abe in glorious three dimensional technicolour, it�s an easy ride for the first hour or two of gameplay. Soon, however, the fiendish puzzles commence. Abe can possess other creatures, as well as summoning the support of his fellow Mudokons. By collecting the organic Sprooce orbs, he can power various devices and pass various checkpoints. All straightforward enough so far. 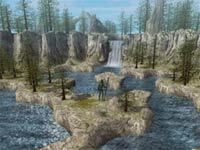 However, later levels see Abe in his traditional role � helping dumb creatures to escape through levels strewn with dangerous animals, weapons, obstacles and traps. And in the same way that TV audiences will stray towards Blind Date if not properly supervised, your stitch-lipped green chums will wander aimlessly into destruction if you don�t have a plan. A callous attitude is not rewarded, either � you generally need their help to get through a checkpoint; so sacrificing your brethren isn�t advised. The latest episode in what the developers promise is to be a quintology (i.e. there�s gonna be five of �em) introduces some fiendish elements into the mix, such as the use of cranes and robots � which your buddy Munch can operate. You can toggle between controlling Munch or Abe at various points, as each of them offers their own skills. Abe has his chanting, possession and leadership skills, whereas Munch is adept at swimming and controlling aforementioned machinery. Worry not though, because the sluggish-on-land Munch can get himself a bath chair, and soon be wheeling around like crazy. The game looks really good � there�s some fogging, but it�s gameplay that matters here, not a technical demo for the Xbox. The game has a great deal of depth, and a great deal of moments where a stout chap can sit back, take a puff of his pipe, and enjoy figuring out just how to set your people free. For some, Abe may have lost his appeal in his transferal from old-skool 2D, but whether you�re an old lag at the SligHut 27 or a new inhabitant of Oddworld, you should really take a look. The other Xbox launch titles are all great at what they do � Rallisports is a great Rally game, Halo a genius first person shooter, but Munch�s Oddysee is a great Oddworld game � a mix of puzzle, character, storytelling and platforming that makes it a genre of its own. Microsoft may have gone over-board in its crowing once they ensured Abe was Xbox-only - he may never be Mario - but to his fans, and anyone who wants some head scratching, rib tickling, involving gaming, he�s certainly no mere �Croc�.